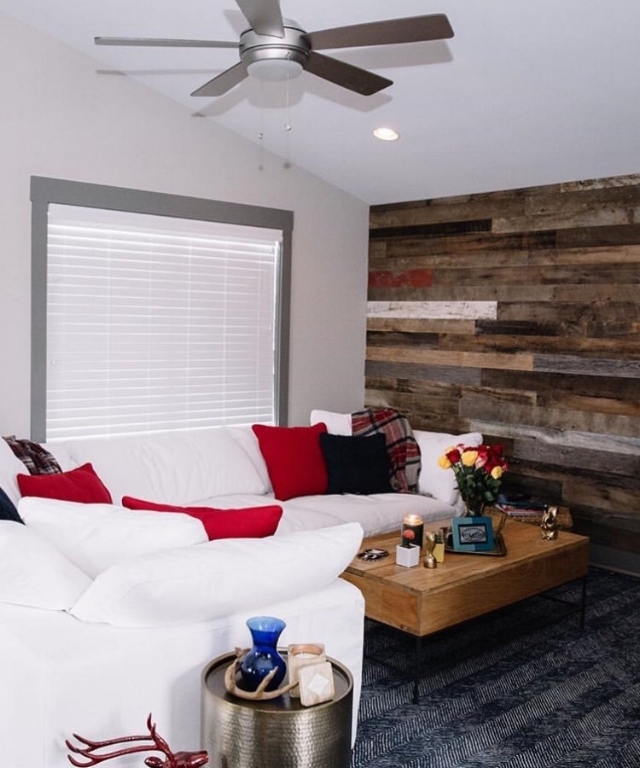 Recently, a customer took to Instagram to document a room transformation for a client. The project included installation of an accent wall with our mixed species, dirty top material. “Dirty top,” or “natural top,” means that the patina of the wood is not planed off. The lumber is weathered, just like the barns that the boards originally came from. This means that the wood retains much of its original character and history. Take a look at the project, from start to finish, below! To place an order, customers can either come into the shop (where we have a sample wall you can check out!) or order over the phone. While we can custom craft an order to fit your needs, our standard accent wall comes in a variety of species, widths and lengths. The barn wood boards are left weathered on the front and planed down smooth on the back so that they are ready to install in your home. For more detailed information about our accent wall, click here. Take a look at the finished product below! What do you all think? Customers: be sure to tag us in your progress photos on Instagram & Facebook!